Portland, Maine is an ideal destination for arts and culture. Fill your trip itinerary with historic homes, art and history museums, live music at the Portland Symphony, and more. Nature lovers will find plenty to explore in Portland. From the many free beaches and parks, to the offshore Casco Bay Islands, it’s easy to experience the incredible Maine coast right from the city. Portland’s coastal location allows visitors to stay active both on and off the water. From hiking and biking to kayaking and sailing, you can do it all in this beautiful city. Take your discoveries even further by visiting Southworth Planetarium or Portland Observatory. Explore the forest hiking trails of Fore River Sancturay, and visit Jewel Falls, the only waterfall in Maine. The perfect place to enjoy an unmatched view of Casco Bay, Eastern Promenade offers open spaces. Visitors enjoy walking along the Eastern Prom Trail, strolling the East End Beach, picnicking, dog walking, and more. Located within Eastern Promenade, this free public beach in Portland is ideal for walking, swimming, playing, boat watching, and launching kayaks. This beach is also dog friendly. Head to Black Cove Trail as an exercise alternative to the gym. Walkers and runners alike will be treated to views of Black Cove and the Portland skyline. 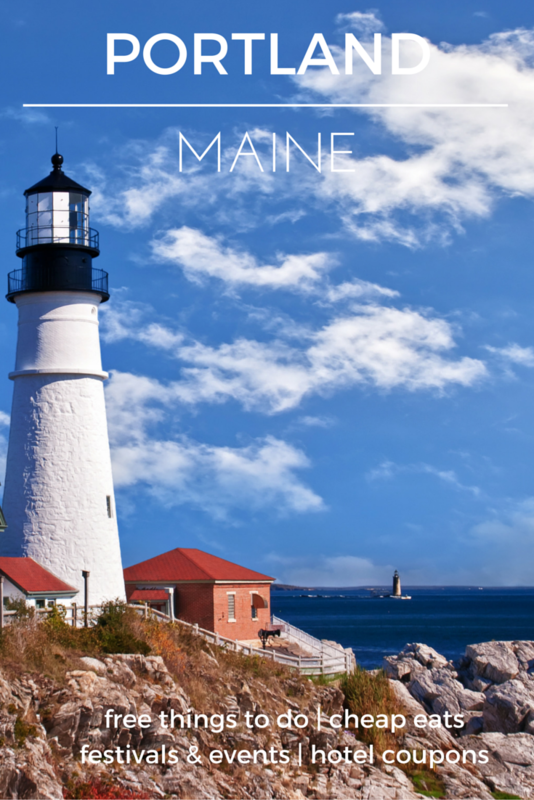 Enjoy iconic Maine sights like Portland Head Lighthouse, one of the most photographed lighthouses; Goddard Mansion, built in 1857; local wildlife and much more. At the corner of State St. and Congress St., you’ll find a statue of Henry Wadsworth Longfellow, the early nineteenth-century American poet. Adult travelers to Portland can enjoy free tours at many of the city’s breweries and more. Consider a mead-making tour at HoneyMaker Mead, or a brewery tour at Shipyard Brewing Co.
Deering Oaks Park has been a highlight of Portland, Maine since 1879. The park now features a playground, rose garden and Saturday Farmers’ Market. Admission to Portland Museum of Art is free every Friday from 5 – 9 p.m. If you want to explore the collections and exhibits, including masters like Monet, Picasso, Degas, and more, be sure to plan a Friday evening visit. See how master florists turn flowers into art! You’ll enjoy exhibits that can inspire your own landscaping, shop for garden accessories and flowers, and much more! This meeting of boat builders is ideal for all types of boat enthusiasts! As long as you love the water, you’ll feel at home among handcrafted rowing boats, canoes, sailboats, kayaks and others, many of which are available for purchase. Experience one of the largest festivals in Maine! The annual Old Port Festival features a parade, local arts and crafts vendors, refreshments, fun activities and more. Each Thursday, head to Monument Square for a free concert, plus beverages from Shipyard Brewing Company and pizza from Portland Pie Co. Explore the flavors of Maine’s best cuisine at Harvest on the Harbor Food & Wine Festival. Located on the Portland Waterfront, you can sample from hundreds of food and drink items. Shop till you drop on Small Business Saturday in Downtown Portland! Kick off the holiday season in Monument Square with Downtown Portland’s annual Christmas Tree Lighting event. Weekends in December, enjoy a free carriage ride through Downtown Portland. The horse-drawn carriages depart from Monument Square every thirty minutes. Walk through Downtown Portland for an enchanted holiday experience. You’ll want to see Portland’s Light Sculptures every year.